Preterm (premature) birth, which is a live birth before 37 weeks gestation, is one of the most pressing challenges to maternal, infant, and child health in the United States. Preterm babies can face lifelong disabilities and are at higher risk of death during their first few days of life. Improving birth outcomes can enable children to reach their full potential. 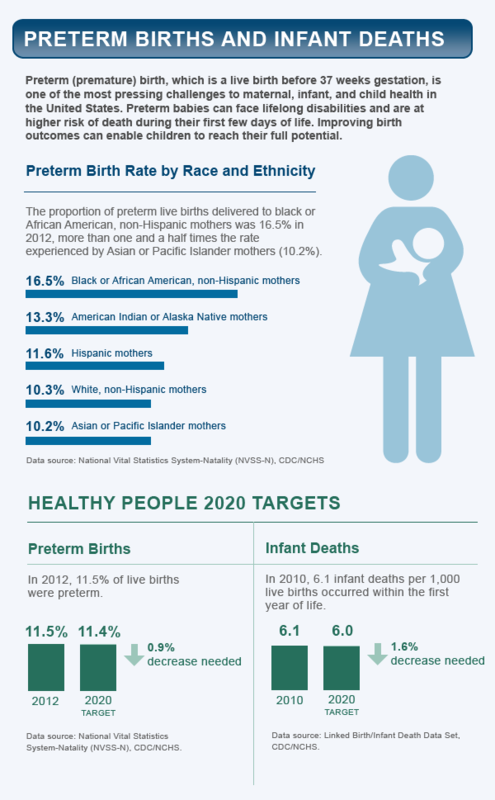 The proportion of preterm live births delivered to black or African American, non-Hispanic mothers was 16.5% in 2012, more than one and a half times the rate experienced by Asian or Pacific Islander mothers (10.2%). In 2012, 11.5% of live births were preterm. Data source: National Vital Statistics System-Natality (NVSS-N), CDC/NCHS. In 2010, 6.1 infant deaths per 1,000 live births occurred within the first year of life. Data source: Linked Birth/Infant Death Data Set, CDC/NCHS.